Help us restore Barfleur's church ! Tickets for the summer concerts of l'Été Musical de Barfleur are available now ! PIERRES EN LUMIÈRES at Barfleur, saturday 18 mai 2019 ! 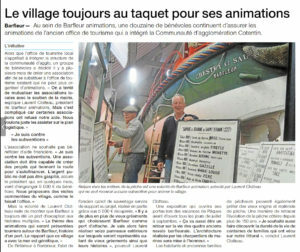 Coming soon : B'Art'fleur, Le Village Fait Galerie! 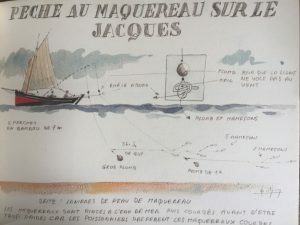 The shelter of the ancient lifeboat «Crestey et Sauvé» (1955), situated on the very end of the harbor quay, will be open to visitors again this year, every weekend of May and June, and then every day from July 1st to the end of September. The visit includes the lifeboat on his launch system, its history from 1955 to 1994 and numerous panels with all kind of precisions about the outings and salvages of the lifeboat. 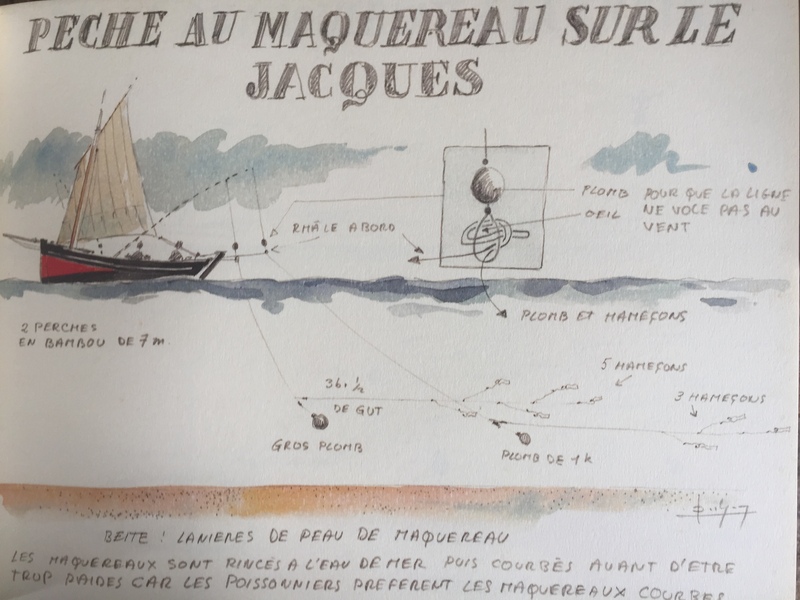 Other things to see : boat scale models, accessories and items of ancient boat constructors in Barfleur who used to build the famous «vaquelottes» : fishermen boats measuring 5 to 7 meters sailing with lug rigs and a jib on a long bowsprit. Professional fishermen used to work with these boats all around the Cotentin coast on small-scale fishing : «le petit métier». From July 1st to September 30th : 10:00 – 12:30 ; 14:30 – 19:00. Help us restore Barfleur’s church ! 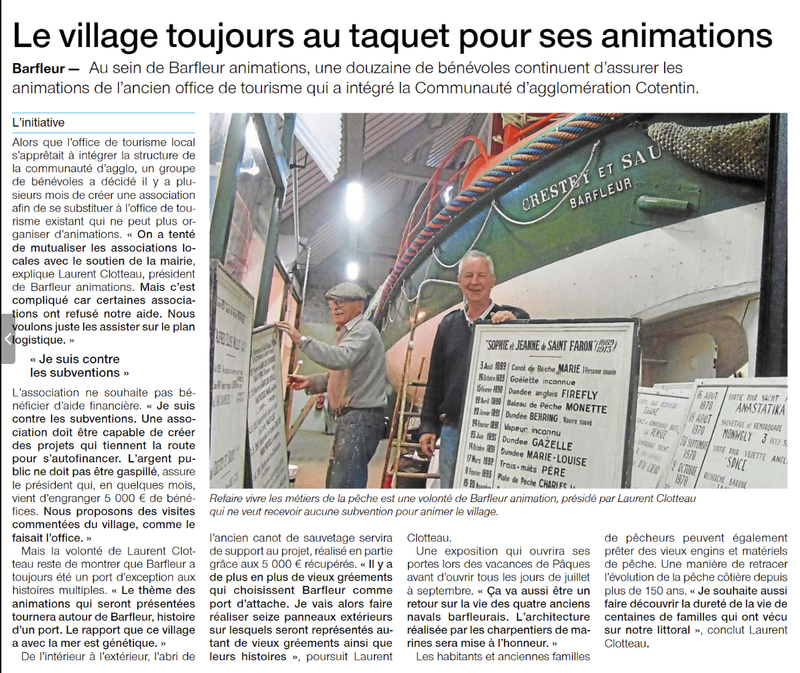 Four major events take place in Barfleur, three every year, one every two years. The classical music festival “L’Eté musical de Barfleur” in the church of Barfleur, “Le Village des antiquaires”, biggest antiques fair of the Cotentin region, the music festival “MusiKenSaire” by Normandy’s artists, and “Le Village fait Galerie”, a huge art exhibition in the homes of the village : Those are our events “Not-to-be-missed” (“Incontournables”) !